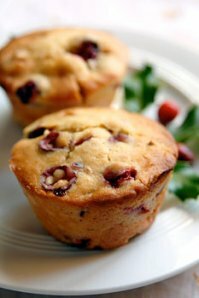 These moist muffins are stored in a tin in the refrigerator. This recipe hails from my oldest sister where it is a staple in their household and a "must do" for their older daughter's birthday. Store them in a wax-paper lined tin to ensure their moistness and to allow the flavors to meld. They are fine on their own, but a shmear of cream cheese ain't bad either! Yes, it takes some time to cut each berry in half, but you really don't want little "bits." You want bites! In a large bowl, stir together the flour, baking powder, baking soda, sugar, salt and zest. In a separate bowl, mix the egg, oil, orange juice. Add to dry ingredients. Mix well by hand. Add cranberries and mix until combined. 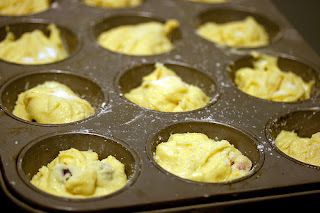 Spray 12 muffin tins with Pam or equivalent. Fill about 3/4 full with batter. Bake for 15 - 20 minutes. Remove and cool on wire rack. Store in an air-tight container in the refrigerator. These sound so nummy! I got to try them.